An Ncook employee (R) delivers food to the house of a customer. At midnight, you can call to order food from a restaurant to be delivered at home within half an hour at a trivial extra cost, any day of the week. This ever-expanding service in Ho Chi Minh City has helped provide more choices for a nighttime meal without the need to go out. Before, you might have had only instant noodles at home. The service is very busy at night, especially from 11:00 pm till 3:00 am. Orders can be made in both Vietnamese and English. Now, customers can order via websites or telephone and ask for home delivery at midnight with the total bill costing just VND58,000 (US$2.8). Dishes available on menus range from rice and noodles to fried fish cake, fried chicken, baked octopus, salad, pizza, hamburgers as well as Japanese, Indian, and Thai specialties. The dishes are illustrated with images and prices on the websites. Well known websites for home food delivery include www.vietnammm.com, www.ncook.vn, and www.blogandem.com. They are also available on Facebook pages. A customer tested the service by ordering a noodle soup dish with beef and a peach juice for VND58,000 at midnight. At 12:30, a restaurant worker knocked on the door of the given address to deliver the food and receive cash. 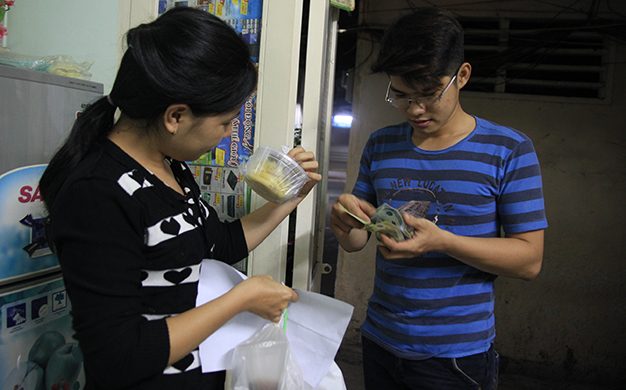 The home delivery cost ranges from VND5,000 to VND20,000 (25 U.S. cents to $1), depending on the distance in the city. The dishes are not too expensive, averaging VND30,000-40,000 ($1.5-2) each. The website www.vietnammm.com offers one of the most professional services, acting as an intermediary between restaurants and diners. Customers accessing this site can order in Vietnamese, Korean, Japanese or English. On receiving orders via the website or telephone, Vietnammm will transfer them to the restaurant chosen by a customer and the business will then be in charge of food delivery. Accessing the website, customers can select not only food but also the restaurant processing it. A list of over 800 restaurants offering home delivery services is available on this website. Though the website is available at all times, most restaurants are closed from 3:00 am until early the following morning because there are few orders. The owner of one restaurant said that she has sold more dishes to customers for a year thanks to her coordination with www.vietnammm.com. The demand for ordering meals at night is big and increasing in this city, according to another restaurant owner. Pham Van Tai, of www.ncook.vn, said his business receives an average of 70 orders for home food delivery from 3:00 pm till 3:00 am. One problem restaurants face now is the lack of delivery staff. Several owners admitted they sometimes have to refuse orders since they would be unable to deliver them quickly.